Long before my twins were born, I anticipated all the challenges: How do I feed them at the same time? What do I do if they’re both crying? And one of the worries I was already anxious about was, How in the world do I manage toddler twins? Because we all know that the toddler stage isn’t exactly smooth sailing, and that’s just with one toddler. Personally, I much prefer the toddler stage over the newborn one, tantrums and all (sleep deprivation and I don’t get along). But after three kids, two of them twins, I also know it doesn’t always bring out the best in me. What makes the toddler stage especially challenging? Toddlers are wired to test their boundaries, all while they can’t exactly communicate clearly. They’re also learning to be more self-sufficient (“Me do it!”) and independent, even if they physically can’t do these tasks quickly just yet. As any twin mom knows, each twin has his own agenda. Just as you’re disciplining one child, the other makes a run for it (or does exactly what you told his twin not to do). Perhaps they both want you at the same time and will whine until one wins. And unlike singletons—even those with siblings—twins are going through the same milestones at roughly the same time. This explains why dealing with twins, as opposed to, say, a toddler and a newborn, is a challenge. Because if there’s anything more challenging than dealing with a toddler, it’s dealing with two at the same time. Raising twin toddlers can feel like a non-stop balancing act, trying to discipline one while making sure the other doesn’t dart off. Family life can be harder with toddler twins simply because there are two of them. In an effort to regain my sanity as quickly as possible, I made many mistakes with my toddler twins. The kinds of mistakes I would avoid if I were to do this all over again—the ones that at first seemed like the right thing to do, but had backfired. Compared to their singleton counterparts, twins are more likely to fight over the same thing. Never mind if you bought two of the same cars or got one twin a Batman toy and the other a Superman one, they’ll find a way to fight for the same item. Most well-meaning parents, in an effort to teach the value of sharing, force their twins to share. In trying to be fair, they make one twin give up the desired item so the other can have her turn. Problem is, this doesn’t respect that twin’s desire to keep playing and exploring. Imagine being so into an activity but forced to stop because someone else wants to have a go. It also teaches the other twin that he merely has to whine to get what he wants. An even more effective technique? Use a timer. Any time my twins are fighting over the same item, I set a timer for five minutes so each can have his turn. They prefer taking turns, even for five minutes at a time, than having to give up a toy completely. And they’re reassured that the other isn’t going to hog it the rest of the day—they know they have just as much time as their brother does. Learn more about why you shouldn’t force kids to share. Crying elicits a knee-jerk reaction in all of us. We hear a baby cry, we run to soothe her. The twins start throwing a fit, and we do all we can to get them to stop. After all, one kid crying is bad enough—two is even more stressful. But think about the message that sends. By trying to stop your twins from crying as quickly as possible, you’re denying natural emotions we all feel. 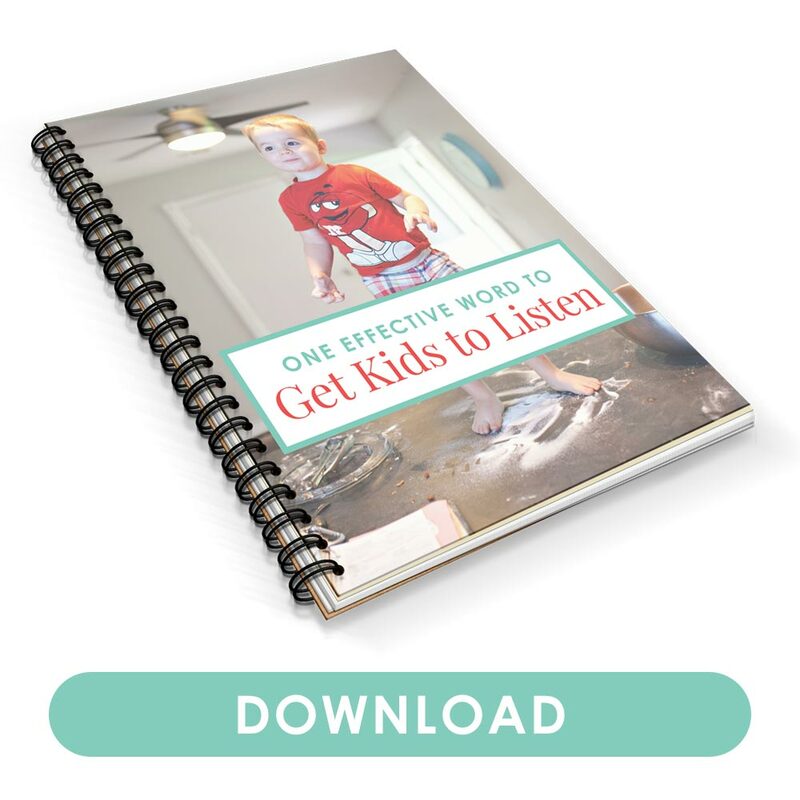 Restoring peace and quiet becomes a higher priority than allowing your twins to sit with their feelings. Because here’s the truth: crying is okay. In fact, it’s not so much about getting your twins to stop crying as it is giving them the safe and loving space to do so. The next time one or both of your twins cry, accept it as a natural thing that happens. Give them a hug and watch their defenses melt away. Don’t discipline just yet, and instead let your body language ease them away from resistance and into openness. This doesn’t enable poor behavior. Your twins aren’t going to think, “Wow, this feels nice. I’m going to hit my brother again so I can get more hugs.” The discipline and lessons can come later, once they’re calmer and more receptive to it (after all, nothing will sink in while they’re crying hysterically). For now, let them cry, even if hearing two sets of tears is enough to stress you out. This is natural, and you’re more likely to get them to calm down this way than feeling anxious or getting upset. Learn more about why you shouldn’t stop your twins from crying. Toddler twins are prone to test every boundary they can find, especially with each other. Establish early on clear responsibilities and rules in your family, and be consistent with it. For instance, you might have a rule about no hitting or contact, even during play time. If this is the case, then the same must apply when they’re playing ninja warriors as when they’re arguing. Clear, consistent rules and responsibilities give them the boundaries from which they can play safely, without wondering whether this is allowed or not. And don’t give up or assume your toddler twins simply don’t listen because you’ve told them not to do something. Habits are based on consistent repetition, so it’d be unfair to expect them to listen the first time around. Instead of placing the outcome on you (“Mom won’t pick me up”), this phrasing places the responsibility on them (“I need to stop whining if I want to get picked up”). If you have twins and other kids of different ages, you’ve likely found that your toddler twins tend to play with each other more so than other sibling pairings. This makes sense—after all, they’re the same age and have the same interests. This also makes it that much easier to lump them together all the time, or to forget to give each of them one-on-one time. You might not even think to encourage them to play separately, assuming that where one is, the other follows. As much as my twins play with each other, I encourage them to play separately as well, especially when they’re on the brink of yet another fight. This prevents potential arguing and meltdowns and reminds them that they can have just as much fun separately as together. Plus, by the time they’ve finally finished playing alone, they’re more than willing to reunite peacefully once again. Get more tips on how to encourage individuality in your twins. But think about the language you use and the way you frame their friendship. Do you assume they’re simply going to fight and there’s no way around it? Or do you correct disrespectful behavior they display toward one another right away? You can even use positive praise to encourage good behavior when you see it. 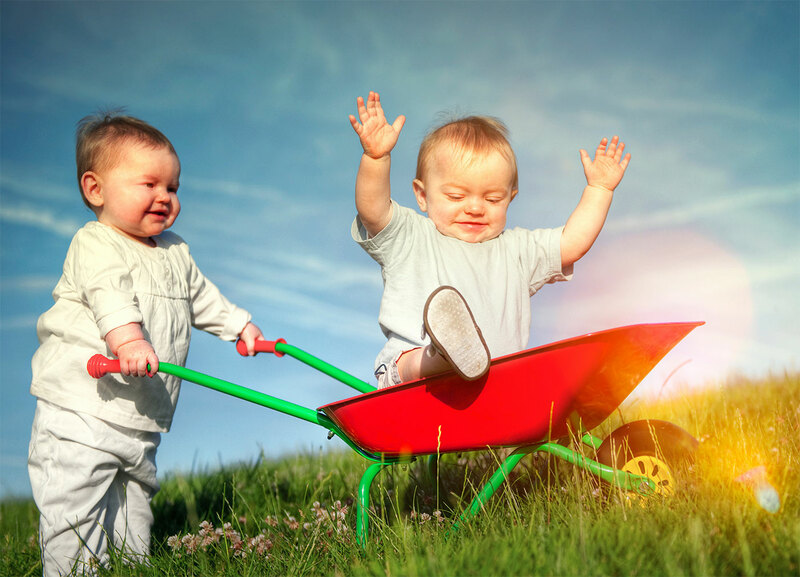 You could say, “You two are having so much fun!” or even simply rub their backs as they’re playing well together. Get more tips about encouraging your twins to get along. Handling toddler twins can feel like a feat reserved for the strongest of us. Indeed, any challenges in parenthood will only make you stronger and more confident, even if it doesn’t feel like that at first. It all starts with avoiding common mistakes many of us make about toddler twins. Don’t force your twins to share, as this not only discourages generosity, but denies them the ability to learn how to take turns. Avoid telling them to stop crying—this not only makes them cry even more, but doesn’t allow them to experience their true emotions (and how to cope through them). 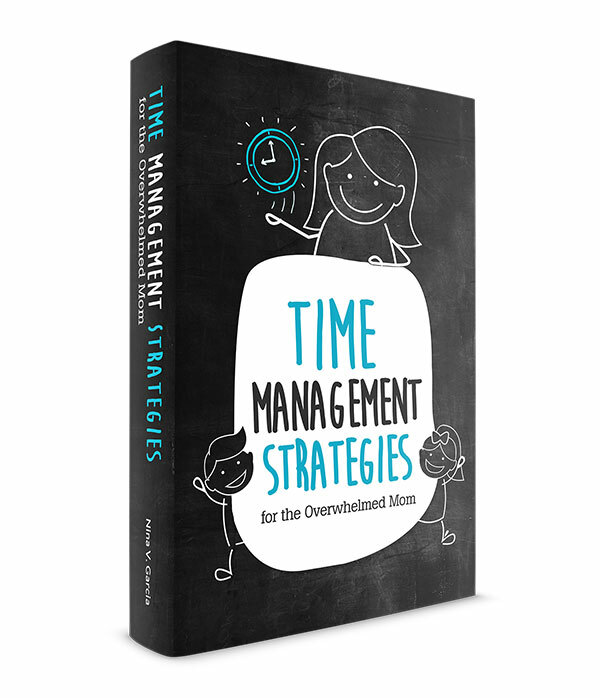 Have clear, consistent rules so they know what to expect, making sure to reinforce them over and over if need be. 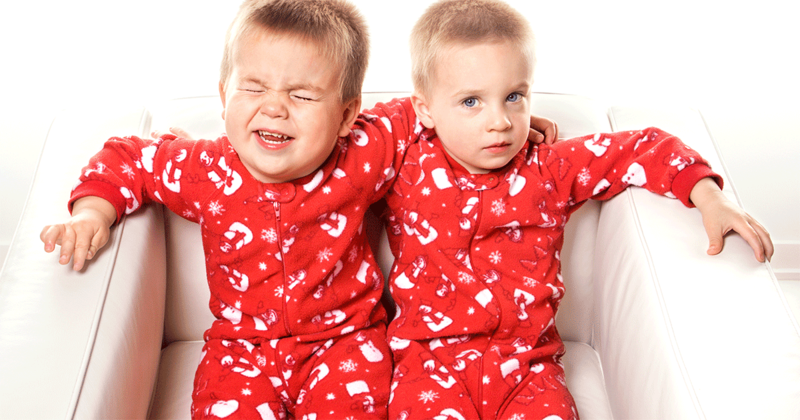 Give your twins time apart so they also develop a sense of individuality (and fight less!). And finally, encourage a strong twin bond between the two, either by reminding them of their special relationship or acknowledging the kindness they do for each other. Twin life—especially with toddlers—can be especially challenging even for the most patient of moms. But you can get through this stage, just as you did the newborn one, and as you will all the others ahead of you. 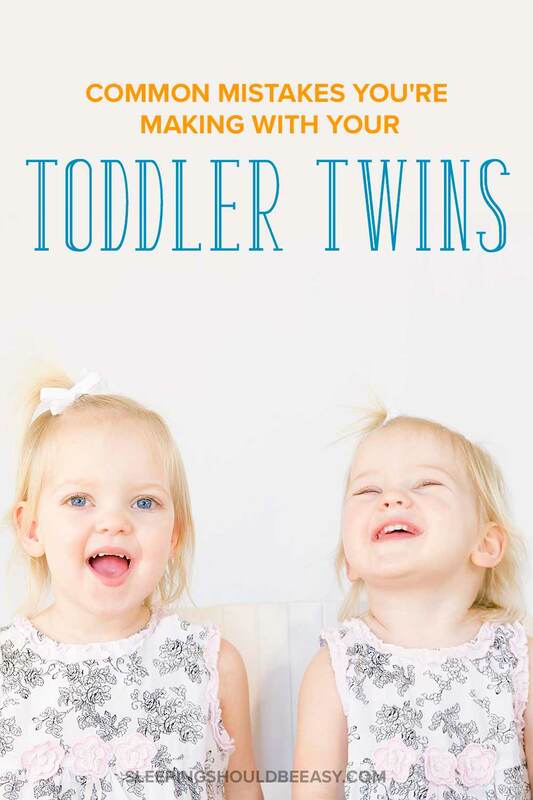 Tell me in the comments: what are your biggest struggles with raising toddler twins?